Since 1932, YARBROUGH’S has served the Southeast Georgia area as your independent Office Products and Printing source, WORKING FOR YOU! We believe in good old-fashioned home grown service. You will notice the difference in working with our sales associates for the best in solutions, support and savings. 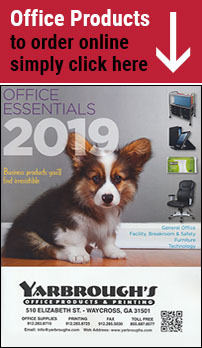 Our Office Products catalog is your comprehensive source for the products you need to keep you ahead of the curve. You’ll find all NEW items, recycled and environmentally friendly products, and Best Value deals at your fingertips! This catalog is available in printed form or right here on our website. We have a huge selection of top-quality office furniture from the leading manufacturers in the business with over 10,000 items to choose from including office suites, desks, seating, storage, filing, desk accessories and much more. The Printing department offers a full range of products from business cards to full-color posters. Digital color copying and engineering prints are also produced on-site along with full service typesetting, design and bindery. YARBROUGH’S, your local business source. We value your business. Give us a call, or a click.